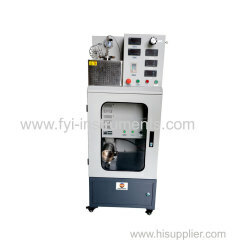 DW7090A laboratory scale melt spinning machine is used for spinning chemical fiber by melting polyester chip. what is spinning process ? In this process, a polymer is melted and heated to a suitable viscosity for fiber production. The melted polymer is pushed through a spinneret, which is a type of die consisting of several small holes. Each hole produces an individual fiber, and the number of holes on a spinneret defines the number of fibers in the yarn. If customer want to fdy spinning machine. We will customized if for you .Normaly it is only for POY Spinning machine. 4. Extensible structure, can add melt pump, mixing function, etc.